I woke up on the 4th feeling a little cold, with lots of gloomy, gray clouds overhead. 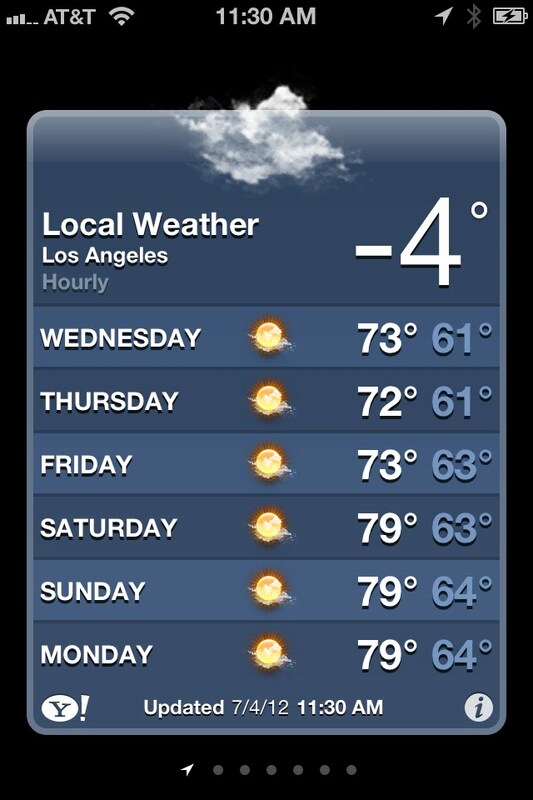 But I didn't know it was this cold outside! 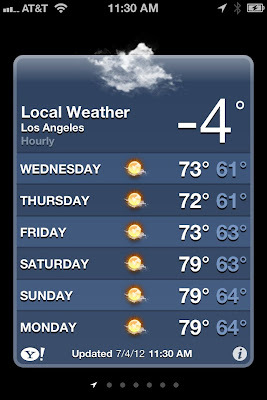 All you people suffering from the heatstroke and wild fires, come on over to Arctic LA. I worked in the morning and skipped the beach activity, because it was pretty chilly. But the rest of the day turned out pretty stellar. America, thanks for having a birthday. Mad dash to a Walmart (LA doesn't have many of these nearby) to find some 'merica pride shirts. BBQs - where I run into my old Georgetown roommate who has long since left her planned international relations career for a PhD in mechanical engineering. She's only got a little internship with NASA this summer, no big deal. Eating a really good burger. Walking through a beautiful Pasadena neighborhood to the Rose Bowl. Well, a hill overlooking the Rose Bowl. Why pay to get in when there's a free view? I'll take any of these houses. Any of them. Fireworks photos are almost always bad, aren't they? At least I got a photo. Most of those people in San Diego probably didn't.